Episode 3 of TASTEABLE: California includes San Francisco's Sauce Restaurant recipe for stuffed crab won tons, a tour of the Chrissy Field's Warming Hut Cafe, the latest in spiced wines, a visit to Petaluma Market on how to care for artisan cheese, a tasting trip to Napa's Oxbow Market. The Collin, The Clayton, and the Sculptured 65. 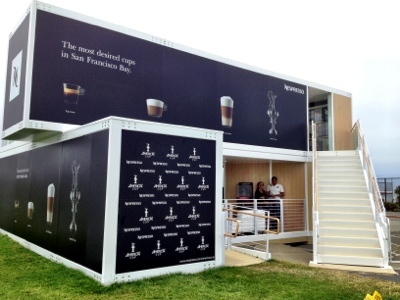 For the America's Cup events in San Francisco, Nespresso has created a series of luxury and high design Pop-Up Cafes around the city. 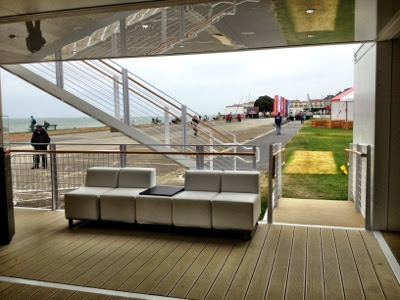 The venue sitting on the "Marina Green" area next to the Bay has a beautiful view, full services, a top outside deck, and is made of the popular new pop-up shop construction material that resembles discarded container boxes.